There are a million thoughts that I want to translate into blog posts, but tonight, let's settle for some light entertainment and quick updates. First off, the hubs and I love funny commercials... guilty pleasure. Don't get me wrong, we love our dvr WAY more and will skip commercials whenever possible, but sometimes you just have to find pleasure with the irritating things in life. aka... commercials. Our favorites lately would have to be insurance company commercials (especially AllState), the AT&T commercials with the kids rambling, and any Shaq commercial. Tonight, we cracked up at Shaq in the Gold Bond for men. He stands there with his big cheesy grin and quickly holds up the bottle of lotion... which seems to be travel size in his ginormous hand. We just about died!! Such a gem. Our personal bet is that this bottle is "normal" size. What's your bet? Welp, that's about it folks. After working for 7 hours, my body and brain are shutting down. A couple of quick notes. Uno, the grandparents came home today so... goodbye peace and quiet. Horrah for basement living! Dos, the hubs registered for his LAST college semester today. Say what?? Can't wait for him to graduate! And tres, this weekend we are going to spend our time cleaning out the garage and planting our very first garden. 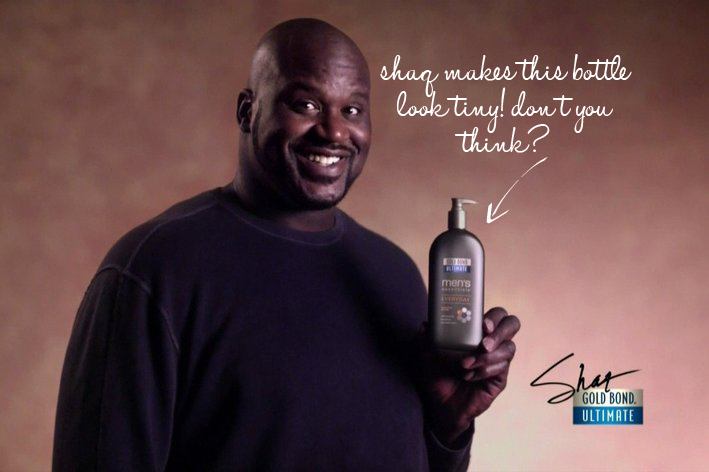 You're right - Shaq's hand totally dominates that bottle! How funny!